A friend of ours is running cattle on some of our pasture this winter. 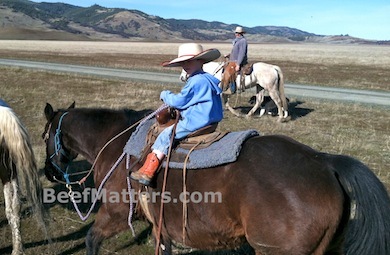 He needed to process his newly purchased cattle last weekend and we had just enough cowboys and cowgirls around the ranch to get the job done. It was an easy ride, perfect for the younger kids. 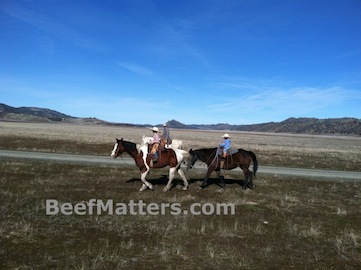 While we were riding, I was thinking about the processing we would be doing after we got to the corral. I was thinking about the recent flurry of media activity surrounding antibiotic use in livestock. But mostly, I was thinking about a friend’s son who was in the ICU fighting antibiotic resistant staph infection. 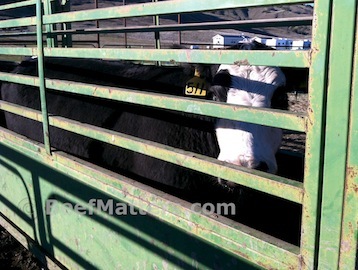 After penning the cows at the corral, it was my job to prepare the vaccines and syringes. We vaccinate our cattle against specific bovine diseases. We seldom use antibiotics, only when an animal is sick and then we consult with our veterinarian and follow his dosage instructions. That seems like an important distinction to me as a producer and as a mom. As a mom, I choose to immunize my children in order to protect them from as many diseases as possible. I also choose to be discriminatory when giving my children antibiotics. I talk with our pediatrician about the necessity of the antibiotic and make the decision I believe is best for my child. I use the same approach as a cattle producer: immunize/vaccinate the cattle against bovine diseases and use antibiotics only as necessary and as prescribed by our veterinarian. Dr. Richard Raymond is a former undersecretary of agriculture for food safety and he wrote about this subject last week. I encourage you to click over and read his article. It is brief, clear and explains (so that I could understand!) which antibiotics are used for human medicine and which antibiotics are used for animal medicine. Antibiotic usage is an emotionally charged debate for many people, myself included because I am a producer and a mom. I hope your friends’ son is doing better . . . a family here in our small town just lost their 8 year old daughter to something similar. Hug your kids just a little tighter today. Hi Tawnya–so good to hear from you! My friend’s son is doing better but it was really scary for several days. I am so sorry to hear about the loss of such a young child in your community. That is heartbreaking; that poor family, I can’t imagine what they are facing right now. Extra hugs for all of our kids tonight (even the 11 year old who is giving me premature gray hairs tonight! ).